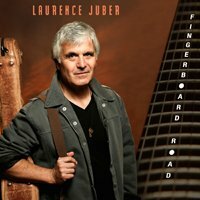 Laurence Juber kicks off 2015 with his latest and maybe greatest! A terrifically warm and intimate sounding release that features an eclectic range of soulful covers with a few new soon to be classic originals! Tell me more: One of the worldâ€™s most celebrated and groundbreaking fingerstyle guitarists, Laurence Juber (Paul McCartneyâ€™s Wings, Al Stewart) has utilized alternate tunings, virtuoso technique and an emotional touch across more than a dozen solo solo releases dating back to 1990â€™s aptly-titled â€œSolo Flight.â€� On his latest LP, â€œFingerboard Road,â€� the Los Angeles-based guitarist delivers a wonderful mix of originals and stunning solo acoustic guitar-styled versions of popular songs ranging from Steely Danâ€™s â€œPegâ€� to The Whoâ€™s â€œWonâ€™t Get Fooled Again.â€� The two-time Grammy-winner is currently on tour in support of â€œFingerboard Road"
Laurence Juber's career as a solo guitarist has been extraordinary. His coverage of popular music ranges from American folk standards and the Great American Songbook to the Beatles, Motown, Stax, Seventies rock anthems, and Steely Dan. His own compositions display equal standards of craft and variety. Fingerboard Road is a fine addition to his body of work. The program begins with the original, "Without Annette," from the improvisational stage play Juber co-wrote with his wife Hope and Jeff Doucette, which evokes the energy of this well-reviewed comedy. Steely Dan's "Peg" follows, which, as a guitarist, struck me as unlikely for a solo arrangement, although Juber naturally pulls it off with aplomb. "Go Now" is a nod to his Wings bandmate, Denny Laine, who brought the young Juber to Paul McCartney's attention. Juber's rendering of Pete Ham and Tom Evans' "Without You," a chart-topper for Harry Nilsson in 1971, is arguably one of his best interpretations - I hope it becomes a performance staple for him. Pete Townsend's "Won't Get Fooled Again" may be a more likely candidate for LJ's stage repertoire, since he pulls out all stops with wild strums that evoke the original and his own trademark octave and single-string runs. It's a dynamic masterpiece. Two other Juber compositions, "Fingerboard Road" and a live recording of "Love At First Sight," sit well among these iconic pop tunes. This disc finds LJ challenging himself, yet still delivering his identifiable sound. Juber's fans will want Fingerboard Road, but they should also give it to others, to introduce them to a master.